Zamindar Ka Doctor is a social initiative by SF Sonic, dedicated to the farmers who are considered the ‘Lifeline’ of the country. The fundamental truth is that most corporates involved in agriculture & allied industries, are just focused on delivering better crops, higher yield, better irrigation, natural fertilisers etc. Hence, most organizations tend to focus only on the raw materials and the associated equipments, assistance required for the various functions of farming like tractors, tilling, seedling, sowing and harvesting equipment etc. But at SF Sonic, we believe that we need to care for the health of the farmer as much as the crops and their yield. If we take care of the farmer, the latter will happen. Towards this, at SF Sonic as part of the Corporate Social Responsibility we have started a new initiative called “Zamindar Ka Doctor’. This initiative is focused on delivering healthcare to the farmers in some of the remotest parts of India, apart from ensuring their tractor battery is in good condition. The Zamindar Ka Doctor team visits villages on a given date which is informed to all the villagers in advance. The team consisting of qualified doctors & trained nurses do a free health check-up for the farmers, while the SF Sonic battery experts check the fitness of the batteries in the tractors. Medical advise and corrective measures if required apart from healthier lifestyle habits are shared in these gatherings. As part of this initiative, the sixth edition of ZAMINDAR KA DOCTOR was conducted by SF Sonic in Bagra, Jalore District (Rajasthan) on January 20, 2016. The turnout was one of the highest in the history of Zamindar Ka Doctor Events, proving the increasing popularity of this initiative. 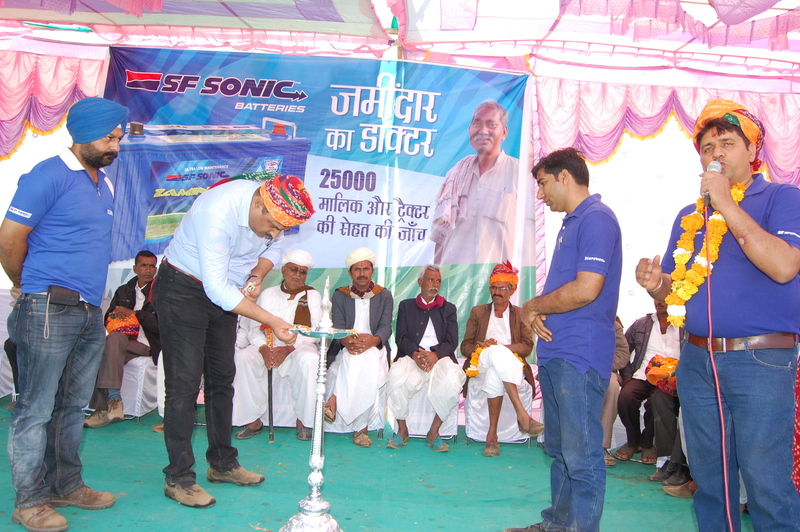 The event included a free medical check-up for Farmers and also free tractor battery check-ups for their tractors. Over 310 farmers and 450 tractors were checked during the course of this event. Zamindar Ka Doctor was covered extensively by the press and a subsequent Press Conference was held at Jodhpur (Rajasthan) on January 21, 2016. Next Next post: How to replace UPS battery?